A missing 23 year old cat was found by a good Samaritan and is back with his grateful petdad again. 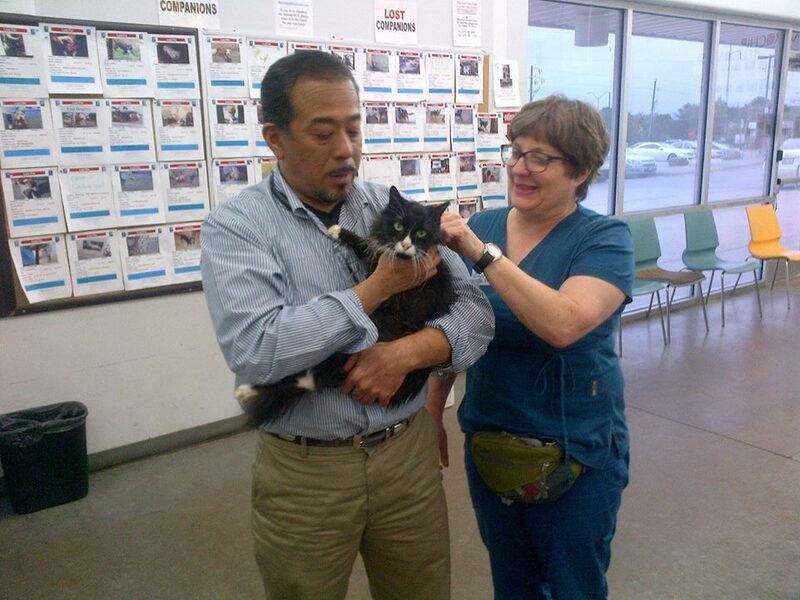 Dallas Animal Services in Dallas, Texas cared for the kitty and was thrilled to help him go back home. A Good Samaritan found a kitty in Far North Dallas late Sunday night and called us for help. Our officer picked up the kitty and brought him back here for care. The kitty was obviously elderly and thin, and seemed quite fragile, so he called on one of our vets for advice. Both the vet and the Officer were unsure if the kitty would make it through the night, but they did what they could to make him comfortable and the next morning he was looking a little better. He was very frail, though, so the vet staff kept a close eye on him over the holiday, and were very relieved when late Tuesday night, the kitty’s owner, Tom, contacted us. Tom had been out searching for the kitty every night and finally ran into a neighbor who knew the Good Samaritan had called us. Tom was very grateful that we had Buddy, and had been caring for him, and thrilled our Officer and our Veterinarian had taken so much personal interest in his kitty. He’s pictured [above] with Buddy, and with Dr. Thorne who managed Buddy’s care while he was here. But there’s more to the story. For three years, Tom’s brother had cared for Buddy, a neighborhood stray, and the two had enjoyed a very special bond. So when Tom’s brother passed away, Tom never hesitated to take Buddy in and care for him. That was nearly 20 years ago. No one is sure how old Buddy is, but it turns out he is at least 23, and maybe older. The good news is this old boy is now back home safe where he belongs, and we’d like to wish Tom and Buddy many more happy years together. We just love happy endings.